The founding member of our fleet is arguably the most glamorous, and if you’re considering a luxury cruise, here’s why you’d be delighted with Anjodi. Authenticity, in a world of remakes, fakes and imitations, is not all that easy to come by. But if it’s a uniquely French affair you’re after, then Anjodi is the real deal. Her classic Dutch design and yacht inspired interior aside, it’s the eclectic all French crew that make the experience. Captain Laurent – Having spent the best part of a decade traversing the globe aboard small cruise liners, Laurent swapped the open ocean for the calm canals of his homeland where he has been barging for over 10 years with us. He cuts a comforting figure at the helm, reassuringly steering Anjodi through low stone bridges and narrow locks along the medieval Canal du Midi. Laurent has a wealth of knowledge of the Languedoc which he is always happy to share. Sandra (Hostess) – Native to Angers in Western France, Sandra has long nurtured an interest in hospitality. And at 25 she has already completed a two year baccalaureate and an additional year of study to specialise as a sommelier. Upon completion of her studies she travelled a good deal before honing her trade at Clos, a Michelin starred Danish restaurant, today she is renowned on The Canal du Midi as one of the finest up and coming sommeliers. Sandra has worked for us in Burgundy and Scotland. Chef Vivien – At 25, Vivien has already been cooking professionally for a decade. After a two year stint in Michelin starred restaurant La Gambetta he made the decision to specialise in pastry and studied for a year at the 2 Michelin Star restaurant Thierry Drapeau. It was at this point he decided to leave his native France for Denmark. After taking a position at a Japanese restaurant in Copenhagen in order to diversify his repertoire, he moved to yet another Michelin starred restaurant (Clos) where he was sous chef and head pastry chef, you’d be hard pushed to find better food anywhere else and his enthusiasm for barging is obvious. Ingrid (Tour Guide) – A consummate professional, Ingrid’s enthusiasm for her work is infectious. Her evocative descriptions bring each excursion to life and as a native to the Midi she knows all of the secret spots and has a powerful command of the Grecian, Roman and Cathar history which make Anjodi’s cruise so fascinating! 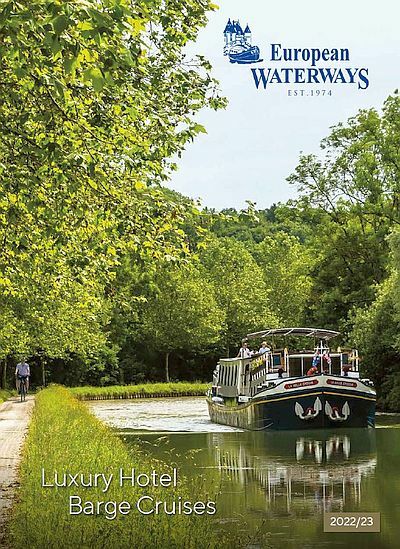 Having lived and worked on barges for the past 5 years she’s well accustomed to life on the river and she’ll have you waxing lyrical about the joys of barging in no time at all. Anjodi received global acclaim as the vessel that carried Rick Stein on a voyage of culinary discovery for his widely lauded television series Rick Stein’s French Odyssey. And recently she’s been linked with other possible ventures, but that’s not the only reason we use the term film star. Because that’s how you’ll feel when you’re aboard, with its rich African hardwood and buffed brass portholes the interior is evocative of a bygone era of glamour and tradition. Whilst the service would rival that of any 5 star Hotel, your wine glass is never dry and you’ll find yourself in awe of the cuisine. All this as you cruise through the Corbieres and Minervois vineyards to the stunning backdrop of the snow-capped Pyrenees, enjoying private tastings and exclusive tours along the way.